On April 14, 2018 the “Helen Duval Veterans Tournament” had a first this year, at Bowlium Lanes in Montclair. 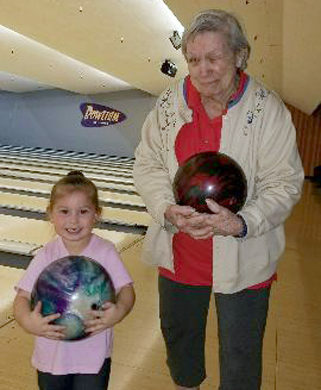 We had our youngest entrant, Bailey Phipps who turned 4 years old in March and oldest entrant, Anne Clifford who turned 91 in March, bowling in the second squad. Bailey started bowling at the age of 3 years old (with no bumpers and no ramps.) and had a book average of 29 for 24 games during the summer of 2017. She has a current book average of 31 with a high game of 85, in her winter league. She has come in first place in her league and has competed in her local BVL Tournament where she won her division, she competed in the state Pepsi Championships where she placed first in the U8 Girls division and has also competed in the local championship tournament where her team came in first place. Her League had their sweeps this morning and Bailey won first place for the girl, adding $60.00 more to her scholarship account. She has accumulated approximately $160.00 in scholarships so far and loving Bowling like she does, has more to add. What a start for Collage. Bailey is also an avid dancer and has been dancing since she was 2 years old. She rehearses weekly at The Talent Factory in Chino where she is being trained in Jazz, Tap, and Ballet. On March 17th she danced in her first competition where her group, “Twist and Shout” (3-4-year-old girls), won High Gold – First place and 4th place overall in the 8 and under division which had 20 groups from other studios throughout the southland. For those who know Linda Johnson-Pilios, she is the proud Great Grandmother. Anne Clifford began bowling in the early 1970’s with her husband, Norm. Through the years, Anne has not only bowled in many league, but has held every league office many times over, especially league Secretary. She is currently bowling 2 leagues a week with family members and friends, using a unique bowling ball that has a collapsible handle. She was a Director on the San Gabriel Valley WBA Board for many years and was recognized as the Director of the year and was inducted into the SGV WBA Hall of Fame for all her hard work for the bowlers. For many years she was a delegate to the WIBC Convention, bowled in the WIBC Tournaments, as well as serving many years as both a delegate to the California State Conventions and bowling in the State Championship Tournaments. In 1982 she started a league called the “Happy Strokers” for bowlers who had suffered a stroke or had other medical problems. Over the years the league bowled 2 games every week, using ramps, walkers, canes and wheelchairs as needed. The league is still bowling at Bowlium Lanes every Friday at 11:30. Anne has been a long time supported of our Veterans, both raising funds for BVL and representing the San Gabriel Valley WBA and SGV USBC at the Annual BVL State Tournaments many times through the years. She also makes great cup cakes for our bake sales. Check the calusbc website for the results of the “Helen Duval Veterans” Tournament. We had bowlers from all over the state, who support their Local Associations, and this very special Tournament. We always say that “The Best Bowlers come from California”, and we thank each of you for your support of our California Veterans.